Can I just talk for a minute about how much I love Thinglink? I did a presentation today (and will do it again tomorrow) for my staff, and everyone seemed genuinely excited about it! 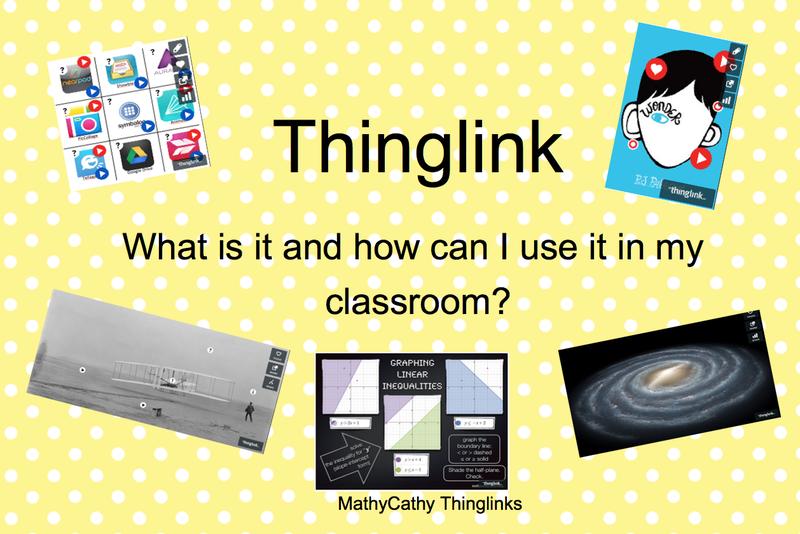 I first learned about Thinglink from MathyCathy (if you teach math, you should follow her! She's great!) back in the summer when I was blog-stalking looking for inspiration for my new gig as technology coordinator. I shared it with a few teachers and they started using it with their students. They think it is great! Before I get going with all of the possibilities, let me tell you what it is. Thinglink is a website and an app that allow you to attach nubbins (ie. touchable links full of information) to any picture your heart desires. Let me caution you that the website has been extra picky lately about what pictures they allow you to use (think copyright issues), but honestly, I think it is more fun to create your own pictures! These nubbins can include regular text, pictures, videos, or links to websites. Now, if you are wondering how you would ever use something like that, let me give you some ideas! 2. Introduce your new unit topic to your students. Create a picture (I like using PowerPoint) and take a screen shot and import it into your Thinglink. Then, add factual nubbins, videos, and websites that explain each part of the unit so students get a preview of what is to come. I see this being especially helpful on those days when you are giving a test, and everyone some kids finish early and need something to do. Give them the Thinglink to give them a head start learning the new material. 3. Use it to introduce a new book in Lanugage Arts / Literature class. I created this Thinglink for our Language Arts teacher who is reading the book Wonder. There are links to the author's page, and information about the medical condition the little boy in the story has. The best thing is that you can create Thinglinks on your iPad or computer, and as long as you are logged into the same account, all of your Thinglinks will be together. The next best thing is that when you video using the iPad in Thinglink (for a nubbin), it syncs with your login information, so you can share that with everyone (not just those people who use that iPad). Have you ever used Thinglink? Great post! This really gives a good intro to ThingLink and what you can use it for. I'm going to share this with my colleagues. Wonderful! I'm glad you found it useful! Thanks so much! I'm glad you found it useful:) Stay tuned for new posts this summer about other apps and websites we use at my school! ThingLink is awesome! I'm glad that someone else uses it too! We just had 3rd grade do a presentation with it. I love that kids can take a photo and make it tell a story (and so much more). Love it! I really like ThingLink, but I haven't used it with my students. I mean they have use ones I have made, but I haven't had them make any. I want to do that this upcoming year. Thanks for sharing. There is a ThingLink Challenge going on that you can join! Just Google it. I have never heard of it but I will definitely look into it! Thanks so much for the inspiration! :) I'm moving to a 1:1 campus so very excited to try!